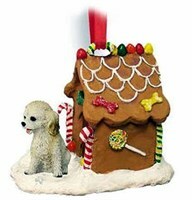 Deck your halls and trim your tree with this sweet and colorful Cockapoo Gingerbread House Christmas Ornament Blonde. Our Cockapoo Gingerbread House Christmas Ornament Blondes are crafted from fine quality stone resin and feature a beautiful full color figurine. All of our Christmas ornaments are crafted for a lifetime of memories and make wonderful gifts, and these beautiful Cockapoo Gingerbread House Christmas Ornament Blonde are no exception.